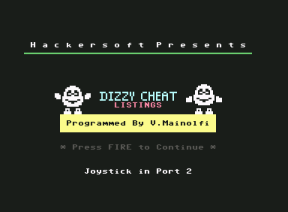 This series of programs pulls together the cheat listings of Warren Pilkington (WAZ) that appeared in copies of ZZAP64! 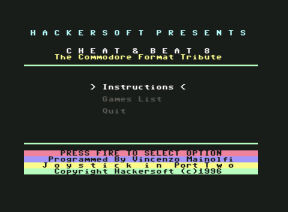 and Commodore Format. 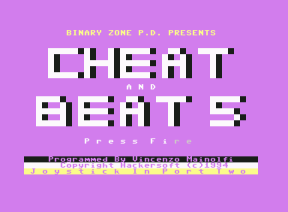 Entirely programmed in BASIC, the programs allowed you to select a game title, which then activated the cheat before you load the game. 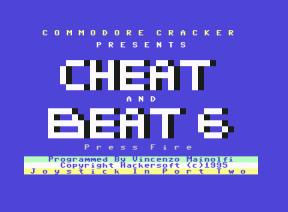 Fortunately, the cheats still work within a Commodore 64 emulator as long as you use the original tape version of the game. ASSISTED BY: Martin Pugh (Pugsy) and Warren Pilkington (WAZ) who provided the cheat listings. 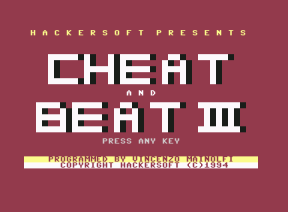 PRODUCTION NOTES: This is actually Cheat & Beat 2. 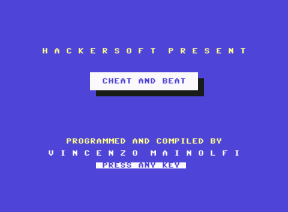 The first ever Cheat & Beat was programmed way back in 1988. 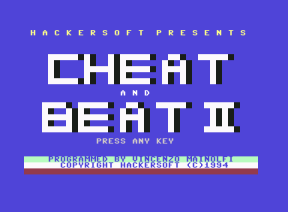 Unfortunately the original has been lost and so this version was to become Cheat & Beat 1.The original version was sold in Computer & Video Games way back in 1987. PRODUCTION NOTES: This was produced in 4 days. Featuring a list of 13 games to choose from, which include: Thurst, Steel, Cauldron 2, Puzznic, Robocop, WWF Wrestlemania, Game Over, Starray, New Zealand Story, Super Off Road, Nebulus, Subterranea and Hallax. Featuring a list of 13 games to choose from, which include: Untouchables, Cosmic Causeway, Deepstrike, Bomber, Twin Tiger, Defender of the Earth, Herobotix, Highway Encounter, Space Academy, Chrome Bros, Skull & Crossbones, Alien Smash and Vengence. PRODUCTION NOTES: A new POKE list to use with an Action Replay Cartridge. Featuring a list of 13 games to choose from, which include: Sub Burner, Skullz, Pud & Dawsy, Chaos Road, Daley's Supertest, Grand Prix Simulator, Monster Mash, Shadow Warriors, Nightbreed, Seymour in Hollywood, Ikari Warriors, Olli & Lisa 3 and Prince Clumsy. PRODUCTION NOTES: Featuring an impressive list of 14 games to choose from, which include: Deflector, Muncher, Dizzy Down the Rapids, Jack the Nipper 2, Tilt, Ghouls & Ghosts, BMX Simulator 2, The Last Ninja, Turrican 2, Double Dragon, Blinky's Scarey School, Powerdrift, Castle Master and Poltergeist. PRODUCTION NOTES: Now includes additional 7 pages of POKES and 5 pages of Other Cheats that include special key pressing sequences. Featuring a list of 15 games to choose from, which include: Action Biker, Dragon Spirit, Magicland Dizzy, Heaven Bound, Dropzone, Chaos, Final Fight, Creatures 2, Batman the Movie, Shadow Dancer, Snare, Hunter Patrol, Galaxians, 1943 and Kane. ASSISTED BY: Warren Pilkington (WAZ) who provided the cheat listings. PRODUCTION NOTES: The first time that a high-res image was used in the series. Featuring a list of 11 games to choose from, which include: Antification, Sceptre of Baghdad, Square Scape 2, Stars & Rings, Spaghetti Western, Overload, Mindmaze, Bee 52 and Amorphous. PRODUCTION NOTES: It took quite some time to program and test this little beast (two weeks to be exact). Most of the time was taken up testing the cheats. Featuring a list of 13 games to choose from, which include: Super Strike, Space War, Harrier, Adams Family, Reaxion, Sinbad, Luna Jailbreak, Rick Dangerous 2, Lethal Weapon, New Zealand Story, Hawkeye, Arac and Snackman. PRODUCTION NOTES: This version features a brand new menu system. 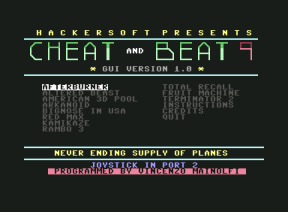 Featuring a list of 11 games to choose from, which include: Afterburner, Altered Beast, American 3D Pool, Arkanoid, Bignose in USA, Red Max, Kamikaze, Rambo 3, Total Recall, Fruit Machine and Terminator 2. 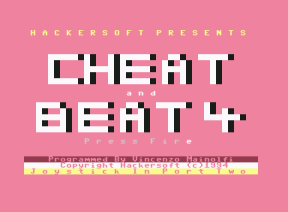 PRODUCTION NOTES: A bit of a spin-off from the Cheat & Beat series, but still part of the same family. 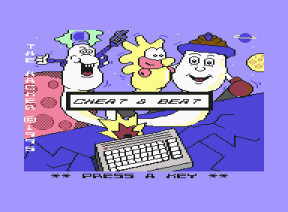 This cheat program includes the cheats to all the Dizzy games by Codemasters. It's also the first time that a sprite has appeared in this series.